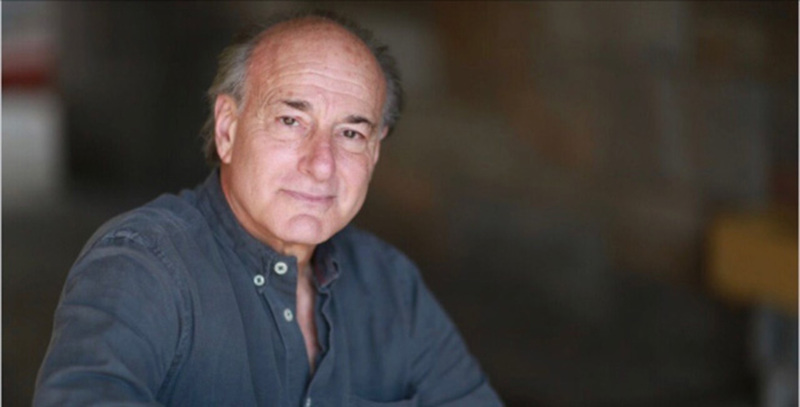 Peter Friedman played Hamlet at Hofstra in 1970 on the University’s original Globe stage. 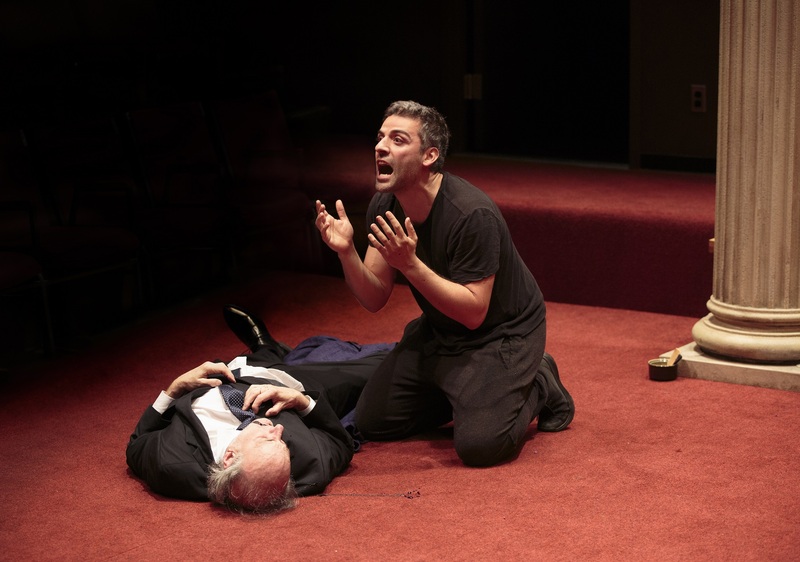 This summer, the Tony-nominated actor (best known for the Broadway musical Ragtime, The Heidi Chronicles, the television drama Brooklyn Bridge and the current Hulu series The Path) is revisiting Hamlet. But this time he’s taking on the role of Polonius, the king’s ill-fated, long-winded, conniving counselor, in The Public Theater’s highly anticipated production, directed by Sam Gold (Broadway’s Fun Home) and starring Oscar Isaac (Star Wars: The Force Awakens), through September 3, 2017. 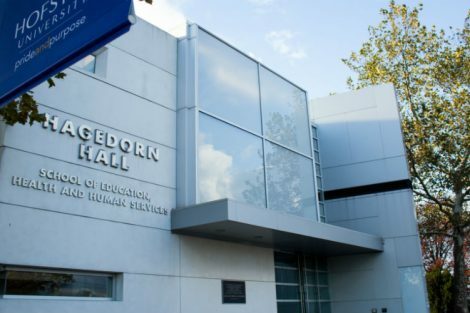 News@Hofstra: How would you describe Sam Gold’s adaptation of Hamlet? PF: I think audiences can expect not to have seen something like this before. This is not your traditional production. It moves really well. If you’ve never seen the play, it’s probably not your best one to start with. It’s more of a meditation, more playful in its approach to the text. N@H: What has it been like returning to Shakespeare? PF: Scary. I thought after all these years of acting, I’ve got this in my back pocket. I had performed a fair amount of Shakespeare during college, and I feel pretty confident about my abilities. However, it’s tougher coming back after working in modern plays – which I adore – where you have some leeway with the way you speak the lines. You do have creative input here, but you don’t want to chop up the lines in a contemporary way. You’ve got to make them fit in your mouth and meet Shakespeare more than halfway. He’s written in a rhythm, and it helps not to pervert that. N@H: What is it about Hamlet that has transcended the centuries? PF: I think youth against corruption; youth against older society – those themes are good ones. Hamlet knows something is wrong, terribly wrong, and he’s trying to right it and trying to figure it out. He feels that he has to straighten it out all by himself. It’s a very rebellious stance. From the actors’ point of view and the producer’s point of view it’s so popular because for every creative choice you’ve got multiple options. Every single question can be answered a whole bunch of ways. There are no single right answers for a lot of moments in the play. Books have been written about how it should be done, and supposedly it changes for every generation and culture. 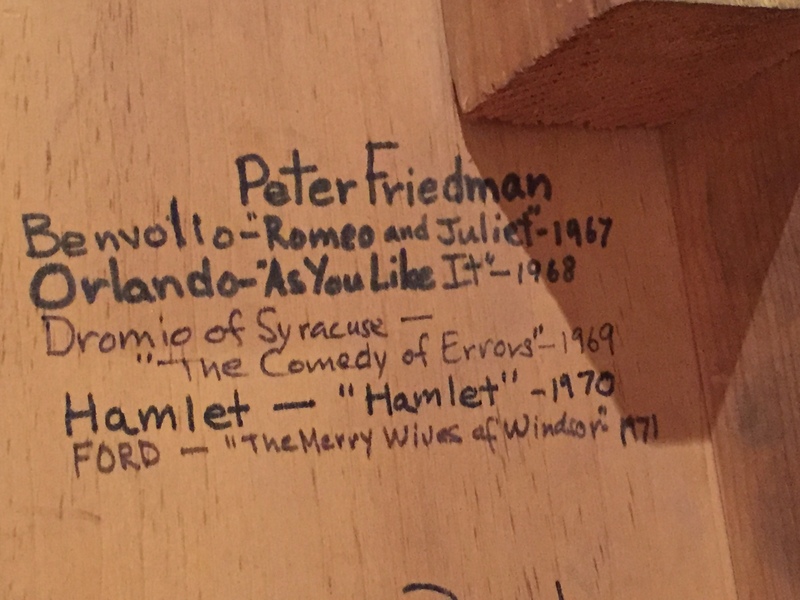 Hofstra students used to sign the back of the old Globe stage and include the parts they played. 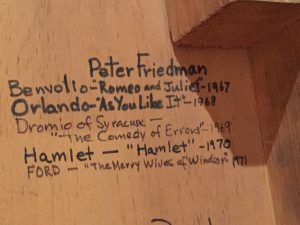 This is Friedman’s signature from the late 1960s-early 1970s. 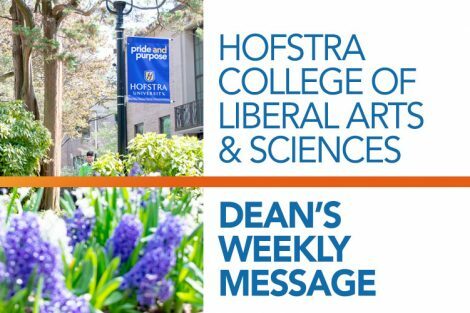 N@H: What do you remember about performing at Hofstra and being in Hamlet? PF: James Van Wart was my mentor while I was there. He was in my corner and helped me a great deal. I so appreciated the opportunity. I just loved it. It was a totally positive experience the whole way through. 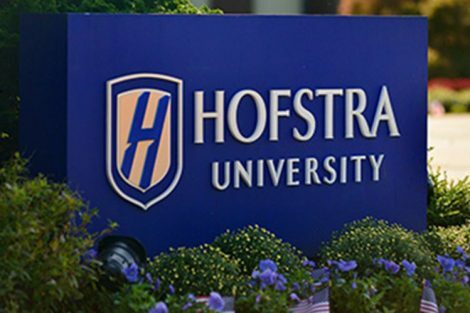 N@H: How did performing on the original Hofstra Globe stage affect you? PF: It was a wonderful thing. Training on any kind of stage other than proscenium is its own challenge and its own terrain. It gives the actor a unique perspective and a unique set of problems to work through. It was always a thrill to be on the Globe set and to work with that fabulous backdrop. N@H: For the reader and the theatergoer, it is hard to have sympathy for Polonius. He gets on Hamlet’s last nerve. What was your approach to the character? PF: (Laughs) Well, he’s an old guy trying to hold onto his relevance in this new regime. He could be fired, but somehow, he’s still there. He wants to be able to say to his boss Claudius, “I can be of real service.” So, he puts his daughter out as a lure so she can spy on Hamlet. At the same time, he sends a spy to follow his son Laertes in Paris. Something is rotten in Denmark, and he really isn’t helping. N@H: Returning to Hamlet so many years later, do you find you have more sympathy now for Polonius? PF: Absolutely. He has to keep his head in the game if he’d like to hold onto his job. He’s under the gun to deliver. He’s upset with his kids as the play starts, but I think once he experiences Ophelia’s upset in the nunnery scene [When Hamlet admonishes her: “Get thee to a nunnery. Why wouldst thou be a breeder of sinners?”], he knows what’s happened to Ophelia would kill Mrs. Polonius if she were still alive. 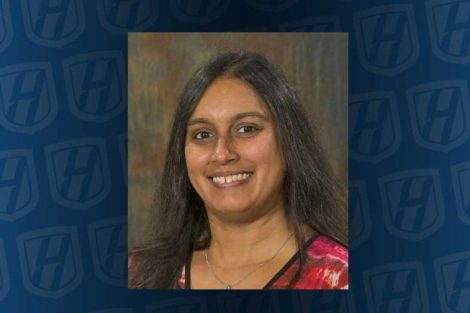 N@H: You currently have a recurring role on the Hulu series The Path that portrays members of a fictional cult-like movement . What drew you to the show? PF: The character I play is a married guy. He and his wife met the creator of the movement when they were in college. He’s sort of this old hippie. He doesn’t have a great deal of motivation at this point to go any higher in the organization. He’s going to stay there and smoke his dope and have a good life. N@H: You are very fortunate in that your career has spanned all the genres – theater, television and film. Is there one that you prefer? It seems that you most enjoy theater. PF: Yes, that’s where I’m most comfortable. But when I’m on a series as a regular, I enjoy that. Where I don’t do well is coming in for a day to do a scene on a movie or television show. I have to feel like part of the team. It relaxes me and allows me to enjoy the work I’m doing as opposed to being the new kid – where they give you a set of clothes and you feel like you can’t screw up your lines and you don’t want to embarrass yourself. That’s a terrible, frightening way to work. I’d rather be among people who know each other. N@H: Reflecting on your career, do you have any favorite projects? PF: The roles – there have been so many that mean so much to me, but there is a current crop of 30-something playwrights and directors who are so good at what they do. For some reason, they include the older generation in their writing, with good parts, and good, complicated questions and situations. I’ve just been crazy busy and happy because of them. It’s great stuff, and I’m having a wonderful time.